12 April 2010, at 10:06a.m. US – Aviagen, Inc., the world's leading poultry breeding company, developing pedigree lines for the production of broiler chickens under the Ross, Arbor Acres and L.I.R brand names, headquartered in Huntsville, has been selected by the North Alabama International Trade Association (NAITA) to receive its prestigious Global Trade Award for 2010. The annual NAITA Global Trade Award honors a North Alabama company or organisation for its dedication to and success in international trade development. “On behalf of Aviagen and our employees worldwide, we are proud to play such an important role here in Huntsville and around the world as we serve our customers globally,” said Don Hachen, Director of Global Planning, Aviagen. 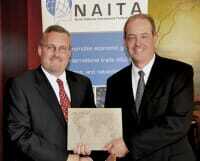 Don Hachen (left) accepts 2010 NAITA Global Trade Award from Martyn Acreman. Aviagen, Inc. has been exporting product for more than 15 years. The company provides day old broiler breeder chicks and hatching eggs to customers in 130 countries around the world located in North America, Central America, South America, Asia, Europe, the Middle East, and Africa. Aviagen’s export volume in 2009 was approximately 12 million chicks. Export sales figures have increased 31 percent over the last two years, and international sales make up almost 50 percent of Aviagen’s total sales. One of Aviagen’s notable successes came in developing new and timely routes for hard to reach markets in Asia. Choosing the most expedient route and dependable carriers for live product shipments is of the utmost importance to successfully service their customers in this region. Aviagen has successfully overcome several challenges in its export business in past years. One of the challenges has been managing the changing global trade regulations while also maintaining consistency and security of supply to its customers worldwide. As the company develops new and emerging markets in various regions of the world, it sometimes had to supply product from different locations and on a compressed timeline. When this happens, the U.S. operation has had to occasionally export product to countries where Aviagen may never have exported and on very short notice. This means establishing reliable air routes as well as understanding health requirements from local health officials. Another major challenge Aviagen faces today in international trade, along with other exporters of delicate and perishable goods, is dealing with the ever reducing amount of cargo space available on international flights. When the global economy scaled back in late 2008 many airlines cut back on the number of flights making it much more difficult to find timely routes to the company’s customers. This is exacerbated by the fact that the baby chicks being shipped to customers must be delivered within 48 hours from the time they hatch or the quality of the shipment could be compromised. By keeping multiple flight routes and tirelessly exploring for new routes, Aviagen has managed to meet customers’ needs on a consistent basis. Aviagen has benefited from NAITA by participating in its local seminars on various international topics. Rather than sending one manager on a three day trip to attend a seminar, the company can take the whole team for a day which benefits the entire export team. In particular, Aviagen has attended seminars on the U.S. Harmonized Tariff System, Incoterms, Letters of Credit, and Export Controls & Compliance, which help to keep the company up to date on the latest changes and newest procedures. Aviagen is a corporate member of NAITA and an active participant in NAITA programs. Aviagen was a recipient of the 2008 Governor’s Trade Excellence Award presented by Alabama Governor Bob Riley. Don Hachen, Director of Global Planning, accepted the Global Trade Award – a custom-designed, commemorative stone plaque – during ceremonies at NAITA’s 27th Annual World Trade Luncheon at The Westin Huntsville at Bridge Street Town Centre on Thursday, 8 April. It was presented by last year’s honoree, Axsys Technologies, Inc., represented by Martyn Acreman, General Manager in Cullman, Alabama.